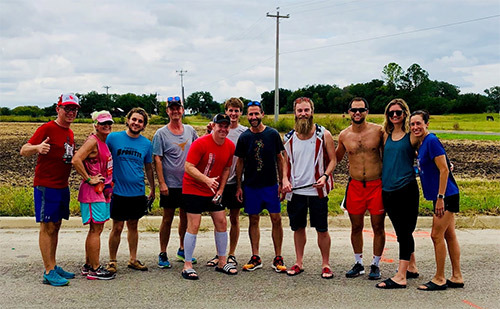 On October 20th we departed on the 8th annual Capital to Coast relay, a 223-mile foot race relay from Austin to Corpus Christi, TX. This was my third year participating in the relay, and my 2nd year as team captain for the Coast Busters. This was probably the toughest year because we had 3 runners who had to withdraw from the race the 11th hour because of either injury or illness. We lost 2 runners within a week of the race, and thankfully we were able to replace them both within 24 hours. There was a day when I was nervous that we were going to be a 10-runner team, but we quickly rebuilt to a full 12-runner team again. The day before the race we lost another runner due to illness. It’s really hard to recruit a runner for 2-day event within 24 hours of the race, so I decided we’d compete in the relay as an 11-runner team. Being down a runner meant that 3 runners would have to pick up an additional leg each, and thankfully 3 of our strong runners immediately raised their hands to run the extra legs. Six runners in van #1: Luke, Patrick, Rich, John, Alexa and yours truly. Five runners in van #2: Mark, Michael, Jenny, Jason and Whitney. Van #1 started us off at 6 a.m. from Brush Square Park in downtown Austin and we were, as they say, off to the races. We held very strong for our respective first legs, gaining ground and passing lots of people. By the fourth leg it started raining in the south Austin and Buda area, which was nice as mid-October can still be pretty hot in Central Texas. Van #1 finished its legs and handed off to Van #2 in Lockhart, and we all went to Taco Cabana for some calories and rest at one of the finest motels in Seguin, TX. With not much rest to be had, we hit the road again to meet up with Van #2 at the 11th exchange and start our respective legs again. Thankfully we’d had cloud cover for most of the day, so the sun didn’t beat us down much. Van #2 ran their respective legs starting around 3 p.m. through the late afternoon and into the night. I finished my leg at around 8 p.m. and then we were off again to get food and rest. We decided on Subway in Beeville and had our food by 9 p.m. We made it to the motel in Beeville for everyone to have their heads hit the pillow by 10 p.m. And then we had to be up at 11 p.m. to start it all over again. We met up with van #2 shortly after midnight and ran all through the morning. This was a tough leg for all of us as the lack of sleep was starting to catch up. I ran a 7.3-miler and I felt like was drunk. It was so dark and foggy, and my headlamp cast this halo before me that was very disorienting. I finished van #1’s leg, we handed off to van #2, and we were off again to Beeville so our three ironmen could try to get some sleep as they each had a 4th leg to run to account for team being a runner down. I think we got back to the motel by around 7:30, and we had to be up and on the road again by 9:20 a.m. Thankfully we’d consistently banked a 25 minute lead on our expected finish time. John and I got up a little early and drove to Whataburger in Beeville to buy everyone breakfast. We needed to get calories in our tired runners. We met up with van #2 at approximately 10:15 a.m. on Saturday and we were off again for the final 12.5 miles. Unfortunately the sun decided to show up in full force that morning, and I swear that even though we were near sea level, it felt like we were closer to the sun. And the Texas gulf humidity is painfully brutal. Rich took off on the 36th and final leg, still at about 20 minutes ahead of our anticipated time. Unfortunately the sun and the heat were just too much. After almost 3 miles in his legs couldn’t keep up with the demand. Impressively he never stopped, but was slowed to a walk. It was a rough last leg, but I’m damn proud that we came in at 29 hours, 53 minutes and 49 seconds. Running 223 miles in under 30 hours is a tough task, especially when the team was down a runner. Rich, Alexa, Luke and I walked in and met the team a hundred yards before the finish line, and we all walked it in together. Rich was immediately escorted to a beach chair under a tent, and Luke continued to try to get him to take in fluids. It took about 10 minutes before nausea and vomiting set in, and then a few minutes later leg cramps to the point where Rich couldn’t bend his knees. John ran to get the van and we loaded Rich up and took him to the ER for IV fluids. After a couple hours, Rich was back to being able to walk on his own two legs, and we left the hospital to meet the team back at the finish line. Well, the team had already exhausted themselves of the finish line festivities and had eaten lunch at Pier 99. Luke, Rich, John, Alexa and I had a later lunch, and the rest of the team hung out and waited on us before most of the crew headed back to Austin in a stinky rental van. The girls and I met with Mark and Natalie for dinner at Chuy’s, and then headed back to our hotel near the USS Lexington at about 10 p.m. I conked out from exhaustion, and then we woke up around 7 a.m. to drive back home to Austin. Capital to Coast we stressful, but so worth it this year. We came in 7th overall out of 46 teams, and 4th in our division (men’s open). I’m super proud of the team and am blessed to have worked with such a strong bunch of runners. And I’ve already registered the Coast Busters for 9th annual Capital to Coast Relay. I’m a glutton for punishment.